Simple mobile app ideas have played a crucial role in the success of smartphones. Several factors such as new hardware capabilities, technological advancement, emerging technologies such as artificial intelligence and backend platforms are driving the change. Mobile app development is not just about whether to go for native vs hybrid. Whether you are looking to partner with Android apps development company to build an app that will rule the Google Playstore or cross platform app to provide maximum ubiquity, it is about pushing the limits of mobile apps revolution. Mobility is giving an entirely new meaning to enterprise solutions. The growing influence of Emerging Technologies such as Artificial intelligence, IOT, Augmented Reality and Virtual Reality are taking both consumer and enterprise apps to the next level. IDC predicts that enterprises’ adoption of mobile apps will double in the next two years and majority of enterprises will increase their spending. We’re seeing the complete evolution right from highly complex, multidimensional apps, to single-use and voice driven apps. Mobile apps are steadily adopting the newest technologies like augmented reality. Self-care apps, a subcategory of health & fitness group were the most trending apps of 2018 by Apple. Global consumer spending on entertainment and streaming apps will significantly grow by a whopping 460 percent from in-app subscriptions to streaming services. Apps are not just about using latest technologies rather about mobile app ideas. Look for problems and see if you could find solutions. Conduct SWOT analysis and try to bridge the gap or equip yourself with innovative ways of solving problems. Simple mobile app ideas strike us at the most unlikely times and when least expected. It is all about nailing down a winning Simple app ideas eventually. Share your app idea with people who are ready to give feedback and listen. Don’t be afraid of sharing and be ready for criticism. It’s always better to seek other people’s opinions on your app idea to overcome any personal favoritism you might have. Once you have finalized the main features and functionality and analyze the market needs, you can create your MVP. Keep in mind that a prototype needs to fulfill your customer’s needs. Therefore, it must be easy to use and engaging for your users. MVP allows you to test the core assumptions behind an mobile app ideas, with an audience that tends to be more forgiving of shortcomings and more likely to give you valuable feedback. What if there was an app that could give you exact details of what you were doing in the past. By using an app would inform what you were doing on a specific day at any given time. With this app, users can know what exactly you did, where you went and with whom you met. Sometimes words are lost in translation. This app idea will help translate the true meaning words spoken by a person in real time. This Simple app ideas will make it very easy and convenient to understand different languages without the need of actual human intervention or translation. Have you visited a store and come across products of brands that you haven’t heard about? But, do you wish to buy the product? This App idea can help users to actually buy products by simply scanning the brand logo and getting all relevant information/review and ratings. This will invariably help customer make an informed decision. Did you break your diet schedule, missed workout or gave a skip to piano lessons? How about an app that tracks your mistakes and gives you a dashboard of mistakes about what you did right and wrong. This app will help you highlight mistakes and give you the right suggestions. It is an era of video & music streaming. Most are subscription-based models, demonstrating money-making potential of the industry is evident. Although video apps are entertainment focused, enabling user-generated content. Live video streaming is a way for a broader audience coverage and higher engagement. This innovative measurement application for real estate agents and architecture is used to measure and draw floor plans to provide accurate estimate of cost related to the renovation of property. Concerning sales, AR apps and similar apps allow prospective buyers or tenants to visualize the new property and improve user experience. With an immersive 3D experience integrated with AR technology will dramatically improve retention of information. AR user manual might shape the way information is shared in an interactive way with step by step virtual guide. While there are several finance and budgeting apps in the app world, this unique budgeting app completely analyzes bank account and expenses to suggest the best possible travel destination and itinerary. 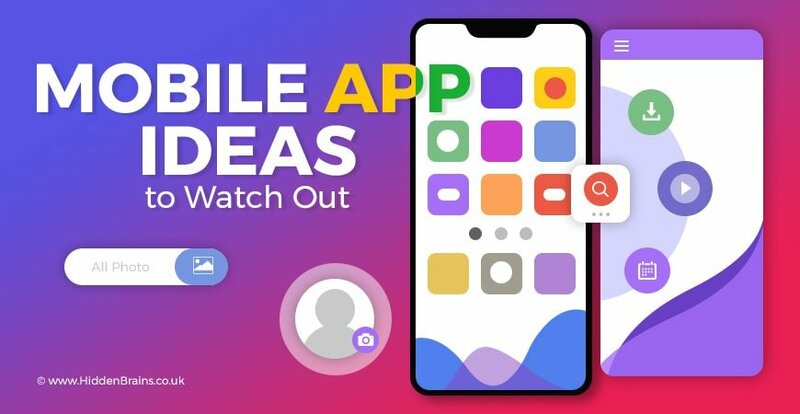 We hope these less explored or unexplored app idea about Mobile App Ideas in 2019 will prove useful. Hire Android apps developer or iOS developer to transform your Simple app ideas into reality. Related Article Part 1: How to Nurture an App Idea into Lucrative App Product? Related Article Part 2: How to Nurture an App Idea into Lucrative App Product? Looking to explore a mobile app idea? Get in touch with our team.